With advice from the Superfast Dorset project, people living and working in Coast Road – a stunning but isolated location between Burton Bradstock and Abbotsbury - have tapped into Government money to future proof their broadband. On learning that they fell outside any commercial or publicly-funded plans for faster internet, locals applied to the national Gigabit Broadband Voucher Scheme, which funds full fibre connections for businesses and the homes around them. Their chosen network provider Openreach will contribute funding as part of its Community Fibre Partnership (CFP) programme. Openreach engineers will now extend fibre-optic cables from the exchange direct to properties in the area giving access to ultrafast download speeds of up to 1 Gbps (gigabit per second) – more than 300 times faster than their current connections and fast enough to stream 200 HD Netflix movies simultaneously. The Othona Community in Coast Road has been offering retreats, courses and holidays-in-community since 1965. Its visitors come from all over the UK and some from overseas. Tony Jaques, who has overseen the growth of the community since 1995, said: "Until I arrived there wasn't a single computer on site! And we still have an emphasis on trying to live simply. But today, of course, our good administration and communication relies on internet connection. Under the Gigabit Broadband Voucher Scheme businesses can claim up to £3,000 against the cost of gigabit-capable (1,000 megabit) internet connections, either individually or as part of a group. Openreach’s Community Fibre Partnership programme is designed to help people in places not included in any current roll-out plans to bring fibre broadband to their local area, working with Openreach to co-fund the installation. The UK-wide CFP programme is bringing fibre broadband to some of the UK’s most challenging areas with more than 30,000 UK households and businesses already able to benefit from faster speeds. The figure is expected to double to 60,000 within 12 months. Across the UK, more than 600 CFP schemes have already been agreed, with upgrades complete in more than 200 communities. Once Openreach has installed the infrastructure, residents can place an order for the new faster services with a provider of their choice. 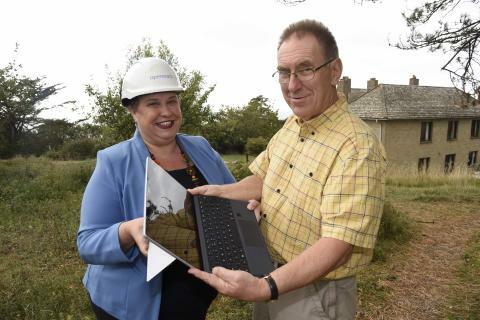 Daryl Turner, Dorset County Council Cabinet Member for the Natural and Built Environment, said: “I’m pleased we have been able to support these homes and businesses, who can look forward to the very fastest internet speeds.